When I first started looking for a property in the country, I had a clear vision placed on my heart to build a garden to share with other people. This is my great dream - and the inspiration for all the hard work I do! - to create a beautiful garden that visitors can also enjoy. Our first event last November was a wonderful 'Spring Garden Party' which allowed us to showcase the property on a sunny Saturday afternoon. As we all gathered for a glass of champagne and a grazing table lunch, it was a delight to take a gentle tootle around the property sharing the story of every aspect of the garden. It’s one of life’s great joys to create something from scratch and to share the background story of all your hopes and dreams about why you’ve done what you’ve done with a friendly audience. I knew my vision of sharing my garden with others was a real message of divine inspiration and it's proven to be so every time we have visitors. 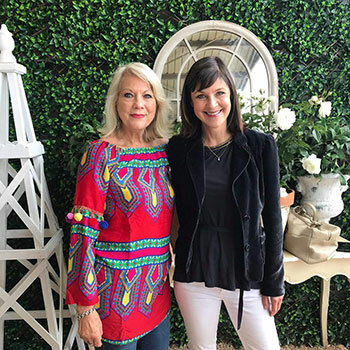 So it is exciting to be looking ahead at the many ways in which we can bring women together as we host special events at Country Style & Life in 2019. We are are continually working on plans for absolutely fabulous events! These include workshops, lunches, day tours and our gorgeous, annual Spring Garden Party. While we are always focused on the property and the garden as our main area of interest, sometimes it's fun to mix it up and include other areas of a woman's world and do things together that we know you enjoy. So expect some fashion and beauty events throughout the year as well! Most importantly, this is about ensuring YOU are at the top of my invitation list! I'll be inviting the friends and followers in my email Address Book first and foremost before anything pops up on social media. So please do ensure you sign on to receive my communiques as soon as they are released. I'm so excited to have this special time and place with you, and I look forward to seeing you at a Country Style & Life event soon. More information on these fab events is coming soon. In the meantime, make sure to join my email Address Book to receive your invitation to all our events. Join a community of women who love all things country style and life. We look forward to your company!